When you hear me say that I'm deep in edits, or that I'm doing revisions, this is where the editor comes in. Whether I'm working for a publisher, or whether I've hired an editor for my indie books, once my critique partner and I have polished my manuscript so that it's the best version of the story that I can submit, the editor then sets to work doing the final "passes,? as they call it. I have experienced being asked to make major changes to a manuscript that my critique partner had pronounced the best work I'd done so far. This can feel almost impossible at times, but the work is always, always worth it once the hidden potential is revealed. It's something indefinable that only an editor can sense inside the manuscript. After pulling up my bootstraps and making those requested changes on that book, it was nominated for several awards. I talked about trust with my critique partner, and a writer has to truly give herself over to the experience and wisdom of an editor. Editors always fall in love at some point with their author's books. Being an author means building partnerships for oneself as a creative entrepreneur. I'm very grateful for the many editors I've worked with over the years, at Harlequin, Avon Romance, St. Martin's Press, my indie editor Patricia Thomas, and Lake Union Authors. Chris Taylor I second every word Julianne MacLean! I?ve been in your shoes too many times to count and my editor?s suggestions have always made the book a better story. 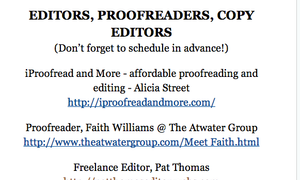 Eternally grateful to my editor Patricia Thomas who is skilled beyond her wildest imaginings. Julianne MacLean I know that you know how I feel, Chris! And Patricia, very glad to be in your group of authors. This page is from Naked Truth About Self-Publishing [unsolicited] whereby the authors research editors and proofreaders, and based on feedback and performance they make recommendations to those considering to self-publish. Tonight I feel blessed? I sure hope you reap the rewards of all your hard work. I admire your talent, intelligence, dedication and PATIENCE! M.P.H. I really love having you as my editor, not just for the editing skills, but because you are so reliable and never miss a deadline. That is an equal part of why you are golden to me. You have challenged me to make my stories the best they can be. We all need someone like you in our corner, urging us on and demanding much, yet being incredibly supportive all at the same time. I owe a great deal of my success as an author to you. It is as simple as that. C.T. Pat has been editing all of my indie stuff lately, and she does an excellent job. Very thorough, and the style sheets Pat does are also very professional and would be essential for consistency in a multi-author anthology. She is as good as any of my New York editors, both in content editing and copy editing. J.M. Thank you once again for making another one of my stories so much better than it would have been. I really appreciate you having the courage to tell me like it is and making me (in the nicest possible way) work harder and put out the best story I can. I really love you for it! I can not thank you enough ... Your editorial advice has been the best I have ever had and really challenged me to dig deeper into both story and character. My point ... I believe a great part of that credit for its success will be owed to your initial notes and jolting me out some of my non-fiction and male fantasy POV. For that, I thank you! B.C.P. You've taken this story to the next level and it is so much better for it. C.
I am amazed at the transformation of my novel. None of it could have been possible without your incredible editing skills.I learned more during this process than I ever thought possible. I Iook forward to working with you again. Thank you! C.D. I'm very pleased with your work and close attention to the details of the story aside from the great work you did editing and making many of the sentences stronger. You brought things to my attention that I hadn't even noticed or thought about before. For that, I'm very thankful. I will certainly keep you in mind for future projects and if you ever need a reference, please feel free to use me. M.S.B. If I haven't already said so, I truly appreciate all you've done for me, for my book. You're the first objective reader I've had other than my agent, but your help was invaluable to me. You really are gifted at what you do. P.G. Pat, I found you to be efficient and a pleasure to deal with as an editor. You helped me take my novels from draft through revisions and editing to publication and still my writing retained my voice and style. My novels were greatly improved by your keen and honest input. Your razor-sharp proofing and your ability to meet my deadlines made me confident of self-publishing quality novels. Thank you. B.P. Pat has been editing all of my indie stuff lately, and she does an excellent job. Very thorough, and the style sheets Pat does are also very professional and would be essential for consistency. She is as good as any of my New York editors, both in content editing and copy editing. J.M. Thank you, Pat! I'm drinking prosecco and taking part in the Blog Blast for Peace movement this evening - chilling out and taking stock of all that's wonderful in life. Thank you for your wonderful job on my manuscript. Your work has really helped. J.P.S. Thanks so much for everything. I have enjoyed working with you, as always, of course. J.G. You have a gracious way of supporting authors. J.M.